Jesse MacMillan and Anna Sudac had very similar backgrounds in Toronto’s music and comedy communities, but somehow never crossed paths until they co-starred in a 2012 theatre piece about Sir John A Macdonald. After visiting Anna’s hometown of Kingston for one summer, they fell in love with the city, and each other, and decided to stay. Jesse and Anna have performed eclectic sets at venues ranging from hoedowns, to train cars, to house parties and have opened for many acts including WANNABE: A Spice Girls Tribute, where they premiered their famous ‘90s medley. They also co-produced and acted in LIVE in Kingston, a romantic comedy/multi-venue concert film, which premiered at the Kingston Canadian Film Festival. Anna has been a featured backup singer in Georgette Fry’s Etta James Show, and Spencer Evans’s tribute to Ray Charles, Fats Domino and Jerry Lee Lewis, and has appeared in the Kick and Push, Storefront, and Toronto Fringe Festivals. Jesse manages the TETT Centre’s tech department, and works as a stage technician at the Isabel Bader Centre. He acted in Judith Thompson’s play, Hothouse, has designed sound and composed music for numerous plays, and starred as Johnny Cash in the Thousand Islands Playhouse’s production of Million Dollar Quartet. 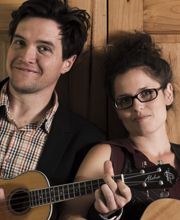 Anna and Jesse teamed up with singer/songwriter David Archibald to produce a faux 1960s radio show, The Pritneer’s Feels Like Family Radio Hour in 2017 and it will feature in the Isabel Bader Centre’s 2018/2019 season.